Last night the old style Castle and Mars tanks were given their initial dose of plasma. I observed the male in the blue Ocean Zoo in distress so I gave the zoo a dose of Sea-Medic and for good measures I gave the other Mars and Castle a dose as well. For fun I added some Sea Diamonds to the three older experiments. Parthenogenesis (pron. : /ˌpɑrθənoʊˈdʒɛnəsɨs/) is a form of asexual reproduction in which growth and development of embryos occur without fertilization. Water temperature is pretty important. According to the hatching guide optimal hatching temperature is between 75°F and 80°F. I took the digital camera to work today and was able to get some pretty good high res shots of Esmeralda and a nice video her and her babies playing in the tank. They like to root around that junk at the bottom of the tank and kick it all over the place. Here is the Basic Ocean-Zoo® kit produced by Big Time Toys that is sold in stores today. It consists of an Ocean-Zoo in a variety of colors with new design aero-vent castle top cover, Packet 1 Water Purifier, Packet 2 Instant Live Eggs, Packet 3 Growth Food, and a feeding spoon. That's a lot for only $4.99 at Wal-Mart! It costs more to get the same kit from Transcience: $9.00 to be exact. You have everything you need to start your colony of Sea-Monkeys. You don't get a packet of Plasma III nor a Million-Bubble air pump, and those are essential for a tank to thrive, especially the air pump. Here are some snapshots of the Ocean-Zoo on my desk at work. 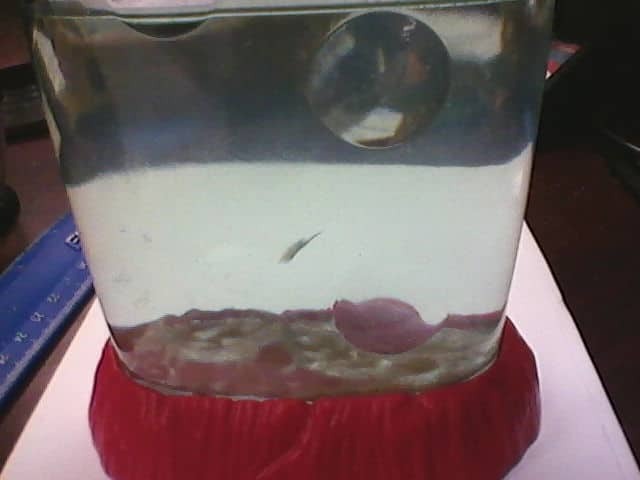 I was able to count 3 juvenile sea-monkeys this morning. Esmeralda still seems healthy and active. I am worried about how she will fair over spring break here in a couple of weeks. I was able to get some close-up snap shots and a video of the mating Martian Sea-Monkeys. What is the Professional Hobby Center? Created for AVID Sea-Monkey fans or as a GREAT GIFT. 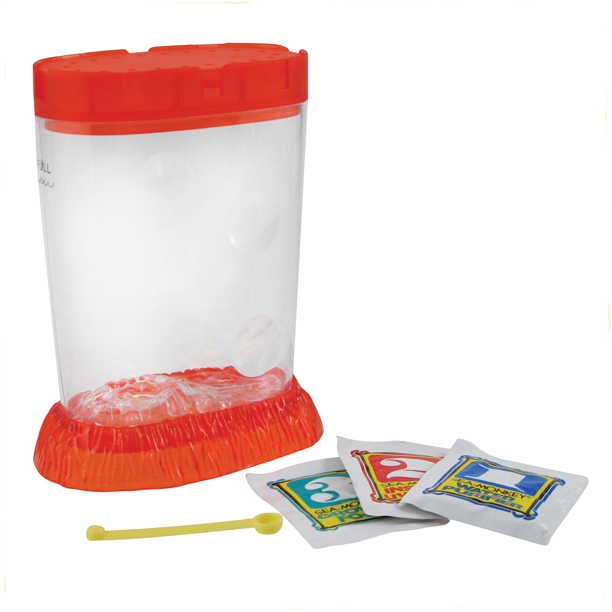 The Hobby Center comes with a Sea-Monkey aquarium PLUS more than $13.00 in assorted supplies including the complete Sea-Monkey hatching and growing system among all the extras. An INCREDIBLE "buy" available ONLY through THIS offer!!! 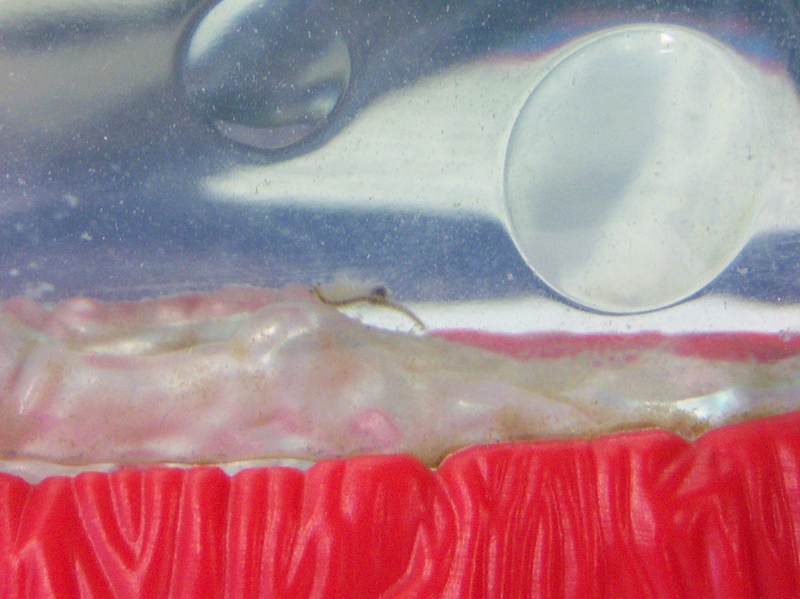 I was able to get some incredible close-up shots of some of the Sea-Monkeys in the Mars tank! The home tanks are doing well. The first Mars experiment is doing quite well with several large adults swimming about. The first Magic Castle tank is down to 2 adults, a male and a female. The Ocean Zoo tank is hanging in there with two adults, a male and a female. The newest experiments are as follows: The Magic Castle in the original style tank really took off! It is teaming with freshly hatched newborns! The original style Mars tank has newborns in it but not as spectacularly as the magic castle. Update on the newest Magic Castle Experiment Feb. 23, 2013. 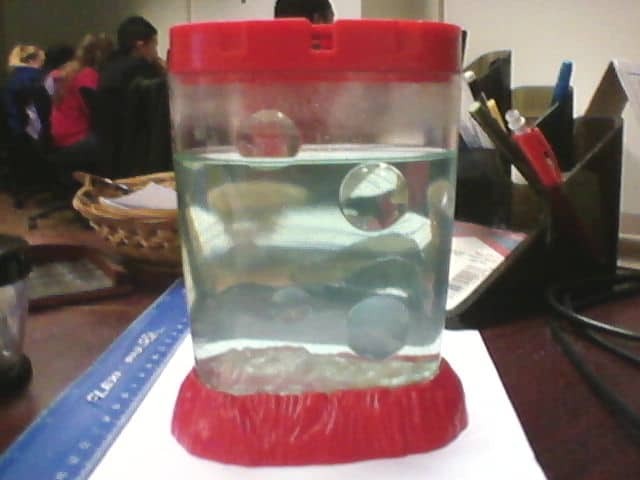 The tank is teaming with newly born Sea-Monkeys! Here is an order form created in Excel that can be used to order Sea-Monkeys® supplies from Transcience. I just choose the items I want and hide the rest. The form will do all the math for you, just print it off and mail it in with your money order. This form will always be available in the sidebar under Downloads. I always use Plasma III with my experiments. I have noticed that kits being made these days aren't including it like they used to... I have a good supply from Transcience, So I always have a packet to add to any new experiment I begin. On the tenth day I add three large scoops of plasma and one large scoop every 10 days afterwards until it is all gone. It it adds a few extra eggs to water so you might see a few newborns a couple of days later. Work tank is still holding only one adult female. I call her Esmeralda. She has a full egg sac and there are a few babies in the tank. I am hoping that the tank repopulates in the next few weeks. I gave the tank a dose of Plasma III this morning and a good oxygen bath with the Million-Bubble air pump. How do you begin your experiments? When I start new experiments, I don't wait 24 hours any longer before adding packet 2. I just mix packet 1 and 2 at the same time. I feed every 5 to 7 days and add 3 large scoops of plasma III on the tenth day and one large scoop every 10 days thereafter until the packet is gone. If the first hatching dies off, the experiment doesn't end. More will likely hatch later. If at least one female survives she will usually have more babies after a few days. An experiment can go on indefinitely as there will always be a new hatching every few weeks. 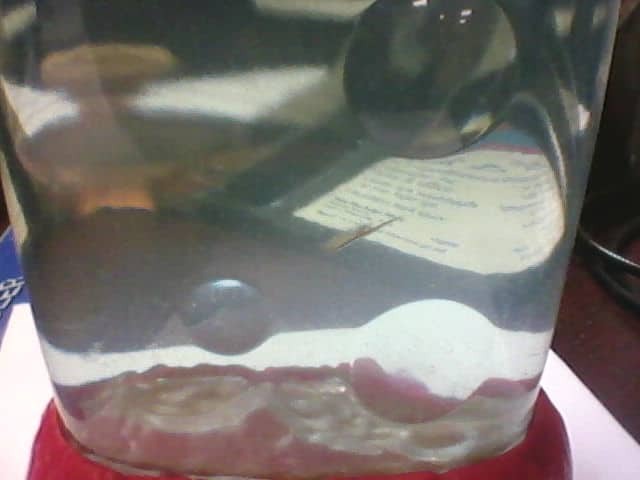 There is only one surviving Sea-monkey in the work tank... A female that I will call Esmerelda. She has had a few babies though and I can see them swimming about. 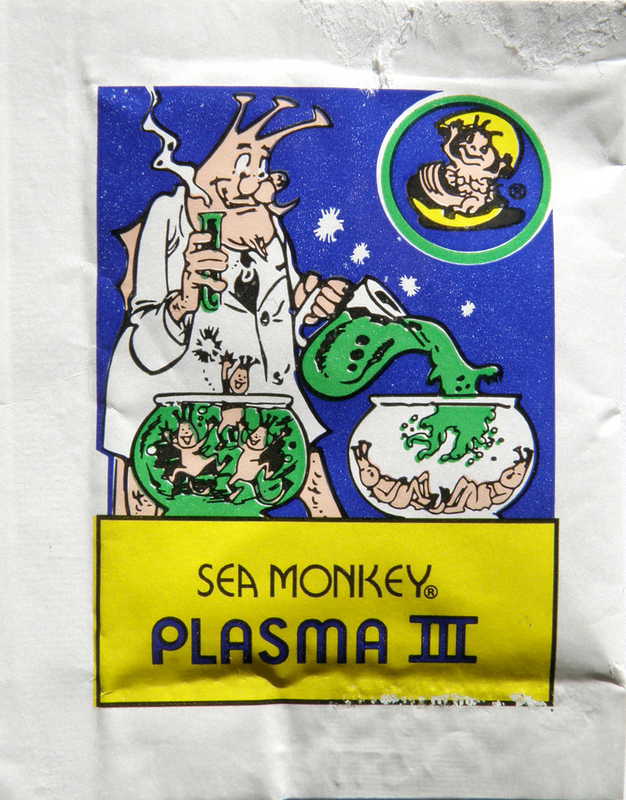 Sea-Monkeys in the Mars tank. 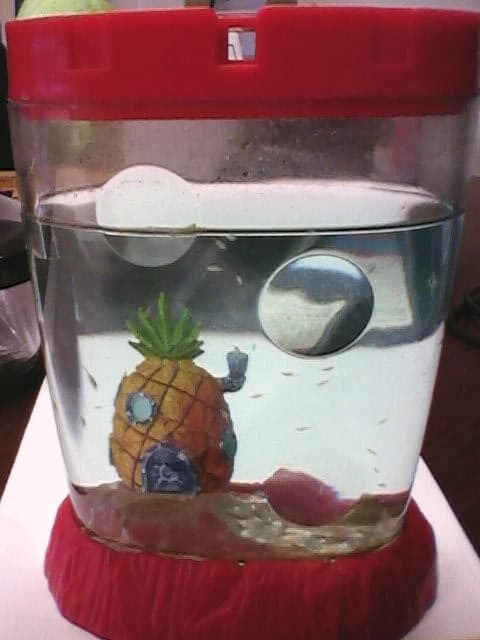 The sea-monkeys have begun dying in the tank at work. I came in this morning and noticed only three survivors... one just died leaving only two. The Ocean Zoo and the Mars tanks have pregnant females. Sea-Monkeys are playing in their Ocean Zoo this morning.